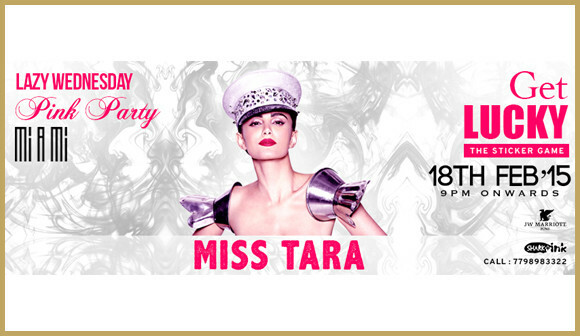 Pune get ready for Miss Tara as she comes to rock club Miami! DJ Miss Tara was scheduled to play in front of a sweet spring audience on the eighteenth of February. Fresh tracks for the party goers in Pune in the walls of Club Miami. If there is one place in India that knows a thing or two about partying, it has to be with the cool residents of Pune. DJ Miss Tara knows that love is floating in the air and the cupid is slaying all those hearts with its poison induced arrows that turns normal people into crazy lovers. Everything now has color and every sound has taste. DJ Miss Tara’s party intended with a post Valentine’s Day track set for all those in attendance at Club Miami. For all those who were captured and unchained by fleeting moments and feelings of love, romance and lust and for those who were lovelorn and still reminiscent of tyeir old lovers, DJ Miss Tara had prepared for the night with tracks to soothe the mood and envelope their emotions. Miss Tara was the smallest of her siblings in a family that was continuously on the move due to their father’s university job. DJ Miss Tara was just a young girl who was a piano student at the early age of 8, but instead of falling for the intricate tabbing and notes of the piano, she became more curious with the loud music and the dancing that came with it. Her parents would fret over her consuming time over dancing and listening to loud music in front not a mirror. Maybe she knew there was an aesthetic appeal in those images. Awaiting her latest album in ‘Let Live’, she will be playing a diverse and different music in contrast to her previous material alongside some of the most recognized names in the music industry. If there is anything that DJ Miss Tara loves more than people, it is her Music and the people enjoying it.